Dr. Jane Lubchenco has been the Under Secretary of Commerce for Oceans and Atmosphere and Administrator of NOAA since 2009. Nominated by President Obama in December 2008 as part of his ‘Science Team,’ she is a marine ecologist and environmental scientist by training, with expertise in oceans, climate change, and interactions between the environment and human well-being. She received her B.A. in Biology from Colorado College, her M.S. in Zoology from the University of Washington, and her Ph.D. in Ecology from Harvard University. Her academic career as a professor began at Harvard University (1975-1977) and continued at Oregon State University (1977-2009) until her appointment as NOAA Administrator. 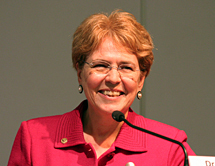 Dr. Lubchenco also served on the National Academy of Sciences study on “Policy Implications of Global Warming” under the administration of George H.W. Bush. She served on several commissions, including the Pew Oceans Commission.